For moderate flow days (between 9 and 12g). The soft, classic feel of o.b. Original Super tampons. Sometimes it’s good to stay with what you love. Super Absorbency o.b. Original Super is best for moderate flow. It starts wikth a smart design! o.b. 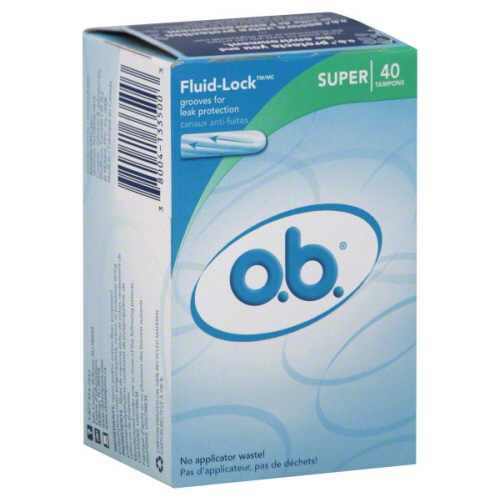 tampons’ FLUIDLOCK grooves guide fluid into the core for up to 8 hours of leak protection. Meanwhile this inner core, or the pledget, is made with rolled layers that expand all around to custom-fit the unique shape of each woman. Working together, these parts add up to an innovative design that offers unsurpassed protection against leaks.